The Hercules beetle, Dynastes hercules (Linnaeus), is a dynastine scarab beetle in the family Scarabaeidae. Some of the more recognizable beetles in the subfamily Dynastinae have males that possess thoracic and/or cephalic horns (Figures 1 and 2). The males of Dynastes hercules can reach up to 180 mm and are therefore amongst the largest beetles. Females are dark in color and do not have horns (Figure 3). Adults are crepuscular or nocturnal fliers and their peak activity is just before daybreak (Ratcliffe et al. 2013, Ratcliffe and Cave 2015). Ratcliffe and Cave (2013, 2015) mentioned that most specimens are captured at light traps between 3:00 and 5:00 AM. Figure 1. Adult major male Hercules beetle, Dynastes hercules (Linnaeus), lateral and dorsal view. Photographs by Ronald D. Cave, University of Florida. Figure 2. Adult minor male Hercules beetle, Dynastes hercules (Linnaeus), lateral view. Photograph by Oliver Keller, University of Florida. Figure 3. Adult female Hercules beetle, Dynastes hercules (Linnaeus), lateral and dorsal view. Photographs by Oliver Keller, University of Florida. The genus Dynastes MacLeay consists of seven species. The other species in the genus are distributed throughout southern North America (Dynastes tityus (Linnaeus) and Dynastes grantii Horn), Mesoamerica (Dynastes hyllus Chevrolat and Dynastes maya Hardy), and South America (Dynastes neptunus Quensel and Dynastes satanus Moser) (Endrödi 1976, Endrödi 1985, Hardy 2003). The status of the taxonomy of Dynastes hercules is uncertain (Ratcliffe et al. 2013), and different treatments can be found throughout the literature (Ratcliffe 2003, Ratcliffe and Cave 2006, Dutrillaux and Dutrillaux 2013, Ratcliffe et al. 2013, Huang 2014). 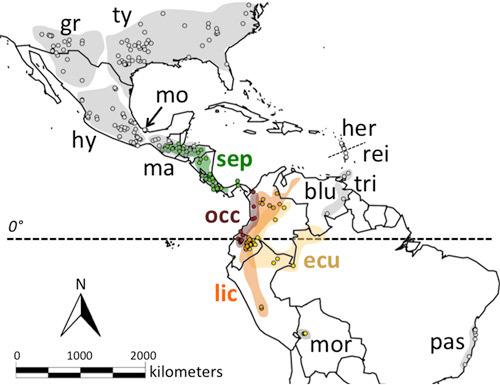 Three subspecies are recognized: Dynastes hercules hercules (Linnaeus) (Guadeloupe and Dominica), Dynastes hercules reidi Chalumeau (Martinique and St. Lucia), and Dynastes hercules septentrionalis Lachaume (Mesoamerica) (Ratcliffe et al. 2013, Ratcliffe and Cave 2015). The status of the South American subspecies is uncertain, and more research is needed to solve this taxonomic uncertainty (Ratcliffe 2003, Ratcliffe and Cave 2006, Ratcliffe et al. 2013, Ratcliffe and Cave 2015). A recent study using multiple data types suggests that several subspecies deserve species status (Huang and Knowles 2015). The Hercules beetle can be found from southern Mexico south to Bolivia, and in the Lesser Antilles (Ratcliffe 2003, Ratcliffe and Cave 2006). Populations of Dynastes hercules can be found in pockets of montane and lowland rainforest in Brazil, Ecuador, Colombia, and Peru (Figure 4) (Rassart et al. 2008, Dutrillaux and Dutrillaux 2013). Figure 4. Distribution of Dynastes species and proposed subspecies. (gr = Dynastes grantii, ty = Dynastes tityus, hy = Dynastes hyllus, mo = Dynastes moroni, ma = Dynastes maya, sep = Dynastes hercules septentrionalis, her = Dynastes hercules hercules, rei = Dynastes hercules reidi, tri = Dynastes hercules trinidadensis, blu = Dynastes hercules bleuzeni, occ = Dynastes hercules occidentalis, lic = Dynastes hercules lichyi, ecu = Dynastes hercules ecuatorianus, mor = Dynastes hercules morishimai, pas = Dynastes hercules paschoali). Figure taken from Huang and Knowles 2015. Adults vary in size between 50–85 mm long and 29–42 mm wide. The body of males (Figures 1 and 2) is black with the exception of the elytra, which can have shades of olive and have a black suture with sparsely distributed black spots (Ratcliffe 2003, Ratcliffe and Cave 2006, Ratcliffe et al. 2013). The coloration of males can also change depending on humidity, with increasing humidity causing the elytra to turn black (Hinton and Jarman 1973). The coarsely punctured elytra of females (Figure 3) are usually entirely black but sometimes have the last quarter similarly colored as in males (Ratcliffe 2003, Ratcliffe and Cave 2006, Ratcliffe et al. 2013). Males possess thoracic and cephalic horns, which are lacking in females (Figure 1 and 3). Body size, large horn size, and coloration make male Dynastes hercules easy to distinguish from other Dynastes species. Dynastes hercules undergoes complete metamorphosis. Not much is known about the life cycle of Dynastes hercules in the wild, but numerous scientists and breeders have observed the life cycle under laboratory conditions. The egg has an average incubation period of 27.7 days, followed by three instars (Figure 5), which on average complete development in 50 days (first instar), 56 days (second instar), and 450 days (third instar) at 25±1°C (Gruner and Chalumeau 1977). The pupal stage (Figure 6) lasts about 32 days, while adults (Figures 1, 2, and 3) can live three to six months in captivity. The total time for complete development ranges 19–21 months, and the total life span can be up to two years (Gruner and Chalumeau 1977). Figure 5. Hercules beetle, Dynastes hercules, larva. Photograph by Ronald D. Cave, University of Florida. Figure 6. Hercules beetle, Dynastes hercules, pupa (dorsal and ventral). Photographs by Ronald D. Cave, University of Florida. 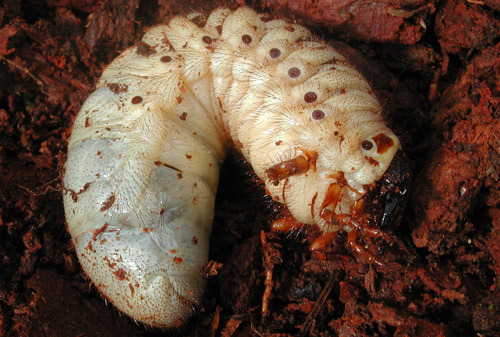 The larvae of Dynastes hercules are saproxylophagous (feeding on dead wood) and develop in rotten logs and decaying tree trunks (Ratcliffe 2003, Ratcliffe and Cave 2006, Ratcliffe et al. 2013). Larvae have been observed in trunks of Chrysobalanaceae (Licania ternatensis Hook. f. ex Duss), Phyllanthaceae (Amanoa caribaea Krug & Urb. ), and Fabaceae (Inga ingoides (Rich.) Willd.) (Gruner and Chalumeau 1977). Adults generally feed on rotting fruit that has fallen to the ground (Rassart et al. 2008) and have been observed feeding for up to 24 hours without a break, under laboratory conditions (Beebe 1944). Dynastes hercules beetles have been used as a model to study sexual selection due to the large horns the males use as weaponry (Beebe 1947, McCullough et al. 2014). McCullough et al. (2014) compared the fighting style of Dynastes hercules with pliers, where the horns are used to squeeze and lift the opponent and subsequently toss him to the ground. These fights usually occur to gain access to females, but horn size is not important to females for their choice of mates (McCullough et al. 2014). Adult males continue to battle until one opponent either helplessly lands on its back, is injured, or retreats (Beebe 1944). The larvae of Dynastes hercules have an important ecological role due to their saproxylophagous life style. They help with nutrient cycling as well as biodegradation. Lately, the rearing of large specimens of Dynastes hercules has become more popular, and breeders try to rear individuals with large body and horn sizes by providing them with optimal nutrition and conditions. Sales of large laboratory-reared specimens of Dynastes hercules can result in prices upwards of $400. Beebe W. 1944. Notes on the Hercules beetle, Dynastes hercules (Linn. ), at Rancho Grande, Venezuela, with special reference to combat behavior. Zoologica: New York Zoological Society 29: 53-58. Dutrillaux B, Dutrillaux AM. 2013. A South American origin of the genus Dynastes (Coleoptera: Scarabaeidae: Dynastinae) demonstrated by chromosomal analyses. Cytogenetic and Genome Research 141: 37-42. Endrödi S. 1976. Monographie der Dynastinae (Coleoptera) 6. Tribus: Dynastini. Acta Zoologica Academiae Scientiarum Hungaricae 22: 217-269. Endrödi S. 1985. The Dynastinae of the World. Dr. W. Junk Publ., Dordrecht. 800 pp., 46 plates. Gruner L, Chalumeau F. 1977. Biologie et élevage de Dynastes h. hercules en Guadeloupe (Coleoptera: Dynastidae). Annals Societé Entomologique 13: 613-624. Hardy M. 2003. Description of a new species of Dynastes Kirby (Coleoptera Scarabaeidae Dynastinae) from North and Central America. Besoiro 9: 3-7. Hinton HE, Jarman GM. 1973. 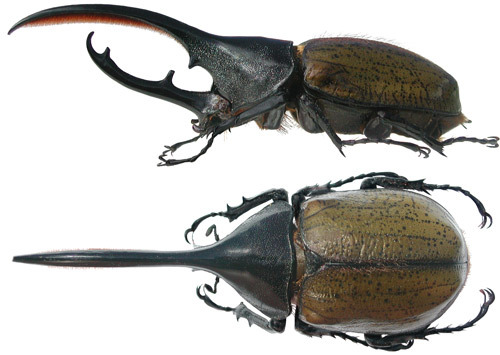 Physiological colour change in the elytra of the Hercules beetle, Dynastes hercules. Journal of Insect Physiology 19: 533-549. Huang, JP. 2014. Évaluation génétique du statut taxonomique des populations de dynaste Hercules des Petites Antilles (Coleoptera, Dynastinae). Coléoptéres des Petites Antilles Tome II: 30-36. Huang JP, Knowles LL. 2015. The species versus subspecies conundrum: Quantitative delimitation from integrating multiple data types within a single Bayesian approach in Hercules beetles. Systematic Biology doi:10.1093/sysbio/syv119. McCullough EL, Tobalske BW, Emlen DJ. 2014. Structural adaptations to diverse fighting styles in sexually selected weapons. Proceedings of the National Academy of Sciences 111: 14484-14488. Rassart M, Colomer JF, Tabarrant T, Vigneron JP. 2008. Diffractive hygrochromic effect in the cuticle of the Hercules beetle Dynastes hercules. New Journal of Physics 10: 1-14. Ratcliffe BC. 2003. The dynastine scarab beetles of Costa Rica and Panama (Coleoptera: Scarabaeidae: Dynastinae). Bulletin of the University of Nebraska State Museum 16: l-506. Ratcliffe BC, Cave RD. 2006. 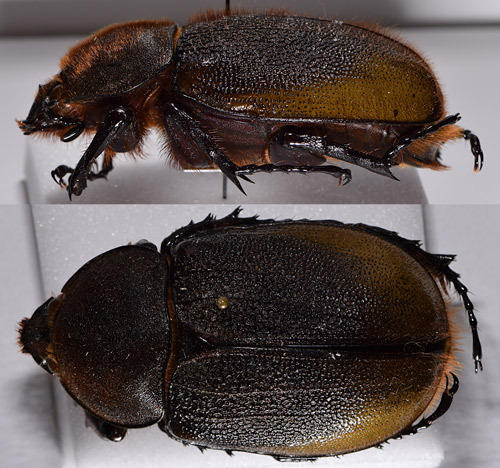 The dynastine scarab beetles of Honduras, Nicaragua, and El Salvador (Coleoptera: Scarabaeidae: Dynastinae). Bulletin of the University of Nebraska State Museum 21: l-424. Ratcliffe BC, Cave RD, Cano EB. 2013. The dynastine scarab beetles of Mexico, Guatemala, and Belize (Coleoptera: Scarabaeidae: Dynastinae). Bulletin of the University of Nebraska State Museum 27: l-666. Ratcliffe BC, Cave RD. 2015. The dynastine scarab beetles of the West Indies (Coleoptera: Scarabaeidae: Dynastinae). Bulletin of the University of Nebraska State Museum 28: l-346.